On Monday I offered my usual quiet, respectful protest to Saint Patrick’s Day by wearing black instead of green, and daring to point out that the good saint is famous mostly for smashing Irish temples and traditions. One reader pointed me to an interesting defense of Patrick, which makes a line of argument I haven’t seen before. And therefore Patrick is a totally swell guy, and worthy of our reverence. If you’re not familiar, the story of Patrick driving out the snakes is a fairly late piece of folklore, often interpreted as a metaphor for driving out the druids. Neopagans have seized on this mini legend, and those few who dare to abstain from Ireland’s anointed holiday often make reference to snakes. Most snake-centric approaches are somewhere in the middle. 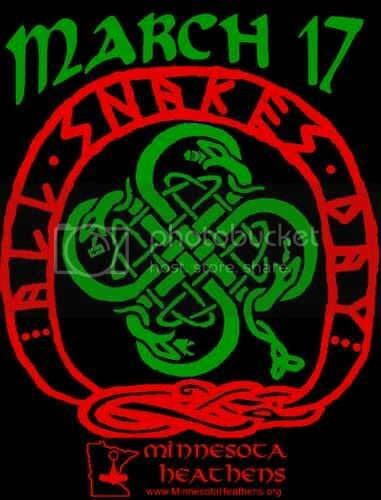 Some Pagans celebrate March 17 as “All Snakes Day,” essentially trying to reclaim the holiday while still getting drunk and wearing green. I’ve never been much for All Snakes Day, and I generally avoid reference to the snake story at all because it’s one of the weakest lines against Patrick. But it is a fair approach. Even though the “snakes” story is over a thousand years more recent than Patrick himself, it’s pretty much always been interpreted as a reference to the conversion. And regardless of snakes, Patrick’s earliest and friendliest biography is very clear that he destroyed Irish sanctuaries and festivals. So the snake issue is kind of irrelevant to the (very reasonable) decision of some polytheists and Pagans not to celebrate a conversion saint. Why indeed. And how does a killer of druids “right and left” now seem any more druid-friendly? That may undermine the snake myth, but it doesn’t make me think druids should start toasting the Green Bishop. As a good reason to celebrate St. Patrick’s day, the article fails. It touches on some of the many good reasons to dislike St. Patrick, but then tells us to ignore those reasons and celebrate him because (shock) Neopagans got their history wrong. Of course, the article closes with my personal favorite chastisement: that there is no other way to stay in touch with modern Irish heritage than celebrating this one holiday. If you don’t like Patrick, you aren’t Irish enough. Someone who’s in touch with Irish heritage. It used to baffle me why, of all people, Pagans and polytheists would find such strange reasons to be pro-Patrick. I understand when Irish Christians put peer pressure on me to celebrate the holiday, but why polytheists? Why get so attached to the celebration of a man who actively worked against our religion—and why use such ridiculous arguments for doing so? Nowadays, however, it doesn’t surprise me. The Patrick apologists never present serious arguments, because they don’t really care about the hagiographic picture of Patrick at all. They don’t care if he was a good guy or a bad guy. They’re only pro-Patrick because they grew up enjoying his holiday, and they’re going to keep enjoying it even if doing so requires intellectual gymnastics. Accuracy or integrity isn’t the issue here, and neither is cultural pride. It’s just easier to go with the crowd than it is to abstain from a minor holiday. Even a holiday that’s essentially about a bigot—in legend and, likely, in reality—against your own religion. See I hadn’t been able to find any historical references to Patrick destroying Irish sanctuaries and festivals. If that is part of Patrick’s history, then the Wiki article is in need of some serious fixing because everyone has a right to know what the real Patrick was like so they can better contemplate the holiday bearing his name. It’s first described in the medieval biography, “The Life of St Patrick,” written by his supporters within a couple centuries after his death. That account at least describes the violent destruction of deity statues at a shrine of a harvest deity, and the disruption of annual holiday ceremonies at Tara. I have not read the biography in full, only selections of it, so it may describe other such acts as well; I can’t say offhand. Folklore from throughout the medieval era has all kinds of accounts of clashes between Patrick and the druids, some of which end in druids’ deaths. These are all legendary and should not be taken as historical fact, but they were all considered appropriate and admirable accounts of Patrick by Irish Christians. Possibly the most disturbing tale is mythical. The early Irish tract, “The Fosterage of the House of Two Cups,” is about a minor goddess who was the foster daughter of mac Óg. She loses her divine nature due to a breach of propriety, then wanders the mortal world, neither fully god nor fully mortal. She is quite vulnerable in this state and cannot take sustenance from mortal food, only surviving off the magical milk from a cup brought from the other world. Unfortunately for her, her fall from grace happens during the time of Patrick, and the bishop finds her and begins reading the Psalms to her. Meanwhile mac Óg is searching desperately for her, trying to rescue her and restore her to her divinity. There is a tense scene where he finds her and is running toward the church to save her even as Patrick convinces her to try converting. She takes baptism, which is anathema to the Irish gods, and begins to waste away in front of Patrick and mac Óg. Slowly, she dies. This account is obviously mythical and doesn’t reflect any historical events of the conversion, but it nicely captures the tension between two irreconcilable accounts of the divine and how to connect with it during the early medieval period. It also may be the only case of death by baptism in any Christian literature. I’m assuming the Pitz-Waters you’re speaking of is the guy who run “The Wild Hunt” or as some people like to call it, “The CNN of the Pagan News World.” In which case…yeah. I’ll come right out and say it…I have issues with that man and it doesn’t exactly surprise me that he’d com up with this kind of thing. Back in the time when I was more commenter than blogger, I spent a lot of time on his website debating (or trolling, depending on who you talk to) with people. When I first got there, it was moderately welcoming to different points of view, but at time went by he, and those commentators he liked more slowly but surely harassed and pushed out those that didn’t agree with him or his view of the facts. I can only imagine its gotten worse, and the whole “if you don’t like St. Patrick, then you’re not Irish enough” certainly sounds like him. This is the man, after all, during the course of conversations basically revealed that to him if “progressive” politics isn’t the foundation of your Pagan religion…you’re a terrible person and your Paganism isn’t Pagan enough. Yeah, multiple gods, pre-christian religion, not pagan enough. you have to hold the same political ideals as your very faith. 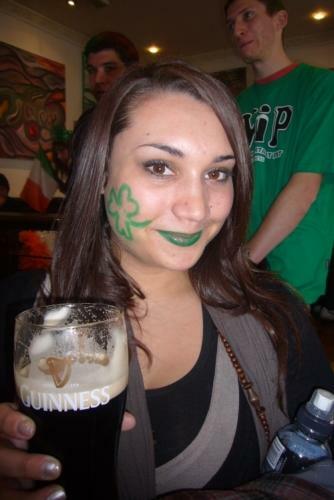 :P So really, jumping around to make St. Pat okay so he can go drink green beer…classic Pitz-Waters. It’s actually Pitzl-Waters; I typoed his name originally, and it’s fixed now. I might agree with him about the progressive politics… :] Well, not actually; to me the primary value of polytheism is pluralism, so of course there is room under the umbrella for many political views. It does puzzle me, however, when polytheists side with a political leaning that is bad on the environment, bad on women’s rights, and that favors the individual over the community. After all, northern European paganism historically put the community before the individual, lived close to nature, and gave women (relative) autonomy compared to other cultures of the time. Most of the politically conservative polytheists I’ve encountered are either Gaelic traditionalists or Norse polytheists of one kind or another, and the primary value of their conservatism seems to be pro-individual and anti-government sentiment. Which is a fine ideal, except when it becomes a fierce “I have a right to do anything I want,” attitude, which is then claimed to be an authentic Celtic/Viking attitude. The Celts and Norse were alike in that the individual had virtually no say in anything. You could do “whatever you want” as long as it happened to be okay with the head of your household and your chief – both of whom had a duty and strong incentive to prioritize the good of the extended family or tribe respectively over any one individual. These are cultures where, literally, the entire family was legally liable for the crimes of one family member; any individual with libertarian leanings would have found a quick end when their family disowned them to protect themselves from the liability, leaving the proud libertarian with no legal standing and no protection. So I don’t see anything particularly traditional or Pagan about a conservative position… but hey, we’re pluralistic so grab a seat by the hearth. I can’t speak for the Celts, but actually with the Norse there was very much an individualist attitude. The difference is that, like with most things, the Norse balanced it with the community focus. There was a very strong press for individual glory and bravery, because they knew that a person who was striving for greatness was going to bring his entire community with them. That’s why where as most collectivist/communal focused societies there were very clearly delineated places for both genders, but with the Norse women not only had equal rights to men, but often men and women took whatever profession pleased them. In a collectivist/communal society, women are valuable because they can breed a new generation, but if you look at Norse society where the individual was valued, you ended up with situations where 50% of a raiding party could be made up of women. And I’m not saying that progressive politics is inherently bad. Wonky, sometimes, yes. Progressive politics is the one that gave us the ideas of social justice and privilege. But, I suppose that’s not surprising when Progressive politics has its roots in Christian Ideology. My issue is when they insist that progressive politics becomes the Dogma of pagan religion. Which is something He was pushing, and would get either abusive or ban happy on anyone who disagreed. Sure, it does seem strange when a pagan might go against something that seems good for the environment. After all, it is terrible to cut down trees in a forest and disturb nature…until your family is facing winter and needs shelter. On the surface, hunting seems barbaric, slaughtering innocent animals…until your family is starving and you can spend 1 day hunting to gather enough meat to equal a month of gathering berries and plants in terms of calories and nutrients. It seems terrible to drill for oil…until you realize that the only reason people get to eat is because we have that oil to power the industry which feeds and protects us. Building a pipeline seems like its terrible for the environment, but it would employ hundreds and hundreds of people, meaning that even more people get to eat. Ironically, when you look at the history, most Pagan societies leaned as much towards the “conservative” side of the political spectrum as they did the liberal. The Roman Empire would be what we would consider very conservative in terms of politics (which is why a lot of conservatives take their cues politically from the Romans, hence partially why they are called Republican). Which is why I tend to look at it that politics shouldn’t have anything to do with Pagan faith. Let your politics be guided by your faith, but not the other way around. To your last point: I don’t know that there’s a clean comparison. Ancient polytheistic societies were almost universally monarchies, or very crude authoritarian “democracies” in the case of Rome and a few Greek states. In that sense you could call them conservative, but it might be more accurate to simply them badly governed. I think it’s more useful to look at the values these ancient cultures espoused, and template those values into our current political context today, even though the societies that first held those values were aristocratic, patriarchal, and largely autocratic. I feel you’re falling into a common trap in your depiction of the Norse as strong individualists. Every warrior society glorifies individual victories and virtues, but that literature doesn’t correspond to an everyday ethos. The typical Norse warrior was expected, above all else, to exercise extreme loyalty and obedience to the head of his war-band. Personal glory could be dolled out as a reward for excellent service, but maverick Vikings were rarely tolerated. I’m gonna start with the end of your comment first. Yes, warriors and everyone were expected to show extreme loyalty to their lord. That’s why I said the Norse created a balance where most didn’t. On one hand you had to be extremely loyal to your lord, but on the other hand you were expected to also achieve for your own merits (so long as that didn’t violate your oaths). There was the push both for the community and for the individual, rather than one or the other. As for the conservative/”badly governed thing” I’m not sure I can agree with that, though I suppose that’s more an issue of defining just what “Badly Governed” means. Conservative, as a term, actually means “to conserve” and conservative governments have always been about preserving the old ways and keeping traditions. Since not all traditions are bad, not all conservationism is bad, which is something people seem to have forgotten in political discourse. We need both Liberation and Conservation when it comes to politics. Ancient governments held by Pagans like Rome and Greece, or really any government with autocracy or monarchy isn’t inherently badly governed. My definition of good government is one that helps its people and furthers the goals of is nation, in which case the conservative governments of say Rom traditionally did a good job. Yes, the Roman empire strip-mined North Africa in to the sandy hellhole it is today, but that environmental damage doesn’t make them an inherently bad government, especially when you realize that by taking all that wood, they supplied wood for the ships that stopped piracy and made the Med safe for travel and trade (feeding and enriching the lives of millions) as well as making paper which preserved who knows how much of human learning. Similarly, the “Liberal” democracy of Athens did much the same thing with the Athenian empire, but the “Conservative” government of Sparta had far less of an environmental impact. If you have a different definition of bad government, please share, so I can know what page your own and maybe get there. Which I suppose leads me back around to something. One of the things that constantly gets me a bit peeved at environmentalists is that they refuse to see the balance. Where they see only the damage…I see both the Damage, but also the Good that comes from it. No creation can exist without destruction, but no destruction occurs without begetting creation. We have a duty to our world, but also to our folk. Most Environmentalists see only the world, but not the people. I should clarify: I did not equate “conservative” with “badly governed.” My point was that the ancient kingships and “republics” had a political system that is completely different from what either liberals OR conservatives want today. Conservative, as we define it now, is still pro-democracy and pro-freedom. Some conservative values, like individual freedom, are completely alien to ancient nations. My point was that ancient “republics” and kingdoms lacked true democracy. Therefore they were badly governed, and they’re not a good example for either conservatives or liberals today. Personally, I try not to color my own ideals into ancient cultures. This is a mistake that both progressive and conservative Pagans make all too often. Liberals are often feminists and environmentalists, so they tell us Celtic women were equal to men (not true) and the Celts were thoughtful stewards of their environments (not true). Conservatives often consider individual liberty more important than communal needs, so they tell us the Norse were rugged individualists. And that, I think, is where we’ll perpetually disagree. I don’t see any evidence for the Norse striking a “balance” between communal and individual needs. Individual occupations were almost universally decided by parentage, and done for the good of the family. An individual could achieve their own merit as (for example) a physician… but only if their dad or grandfather chose at age 3 that they would be a physician. There was little room for individual choice in any important life decision or political decision, and the individual glory you’re referring to was won almost solely within the context of one’s assigned role in life. If you rejected this role you had limited options. Ah, so you say badly governed not because the government functioned poorly, but because the people didn’t get much of a voice. Okay. Not my definition, but I can see where you’re coming from with it and I can actually agree in a way.I was thinking the historian’s definition of bad government, while you were thinking the philosophers. And actually I’m with you, we shouldn’t judge past governments by modern standards because it doesn’t work.They can be close, and they can hold the theories, or at least the birth of theories, but 1 to 1 comparison doesn’t work as well. I only did it because on a macro level it sometimes shows people that “x isn’t good or bad, it’s just x.” and I got in a habit. That I can strongly identify with, and that is certainly the same in the Gaelic tradition (and all I-E cultures with heroic ethics). I think there are strong reasons why that templates to following a progressive political position today. What you’re describing as the right “balance” between individual and community needs is, essentially, far more communitarian than anything in our US culture today. Conservatives who favor individual freedom over community responsibility spin far, far away from that “right balance” of the Norse past. Even most leftists wouldn’t favor something as communitarian as the ideal you’re describing, although they at least tend to put the community first. The majority of the polytheists whom I encounter are more leftist than the progressives (who are mostly just want a nicer status quo), which is why I’ve been writing stuff to draw attention to the radical potentiality of us gods-worshipers. Thanks Rhyd. And I agree with your assessment of leftism among polytheists. Or rather, among Neopagans; among self-identified polytheists there’s a fair minority who are extremely libertarian. It wasn’t just a miter, there’s a body part for each of the four heads. Even at the time I made the shirts, I knew that the “driving the snakes out” was anachronistic nonsense. So much of the holiday gets framed as “Patrick vs. the snakes”, when Patrick is remembered at all, that it made sense for those of us celebrating his death to be up front about it. I know that at the time we all started calling it “All Snakes’ Day” in Minneapolis that there was no trace of the phrase on the internet. I looked to make sure we wouldn’t be stepping on anyone’s toes (or trademarks) before finally turning the t-shirt into something real. I’m not sure which of us started calling it that first (there was a bit of whiskey involved) but it’s so easy a pun to make (from “All Saints’ Day” for those following along at home) that I can easily believe that numerous groups came upon it independently. In the end, I think the only thing that matters is that I need to get the bloody thing on cafe press… if I can just figure out which external drive the original PSD files are on. I wanted that image to display in the comment… I need to play around with WordPress more so I know how formatting works. That’s the one! I did remember there were four different parts, but you know, when describing an intricate picture in words only it’s best to KISS. You know, I didn’t even realize All Snakes Day had started in Minnesota, although I should have guessed, since 80% of Pagan memes seem to come from the Minnesota Pagan community. Thanks for the link, LC.